Yes, we all hear them. The invisible voices that tell us to fire the missle launcher into the idiot driving in front of us that’s going 25 miles an hour in a 45 mph zone. Or the voice that tells us to snag that horrid wig off of great aunt Colleen’s head at the Christmas get-together(C’mon, Aunt Colleen! It’s soooo obvious!) Or better yet, that invisible voice that tells us to lip sync “Shock The Monkey” in the middle of the grocery store, even though it’s only playing inside our head. That invisible voice that comes from some otherworldly place that begs us to cause havoc. Fortunately our vehicles aren’t equipped with missle launchers; poor Aunt Colleen has moved onto the great beyond, and rarely does “Shock The Monkey” ever run on the karaoke machine inside our head(though “Games Without Frontiers” does occasionally on mine.) Besides, I’m not talking about those kinds of invisible voices. 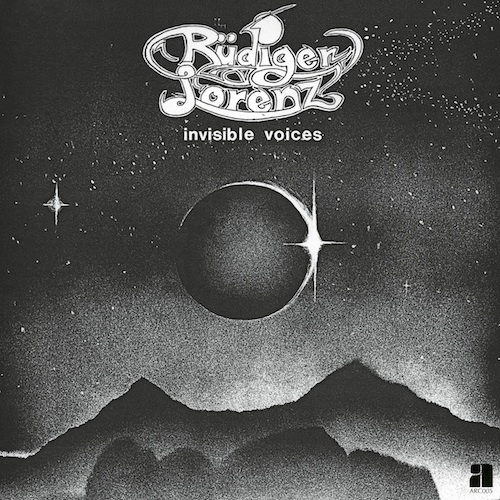 I’m talking about the album Invisible Voices by Rüdiger Lorenz. Who’s Rüdiger Lorenz? You don’t know? Well, actually I didn’t know myself up until this past August. That is, until I read an article about how Mexican Summer, via Kemado Records and Anthology Recordings were reissuing his self-released album Invisible Voices from 1983. All it took was one audio snippet to convince me to pull the trigger and preorder it. It turns out, Invisible Voices is an obscure, little synth masterpiece. Now, this isn’t the only album this German synthesist released. In fact, he self-released 17 LPs and was on 3 compilations between 1981 and 1998. Prolific output is putting it mildly. Not only that, but he built his own synthesizers as well. Even crazier is that music was only a hobby for Lorenz. He was a pharmacist by trade. When he wasn’t creating pharmaceuticals he was creating analog ear candy in his home studio. 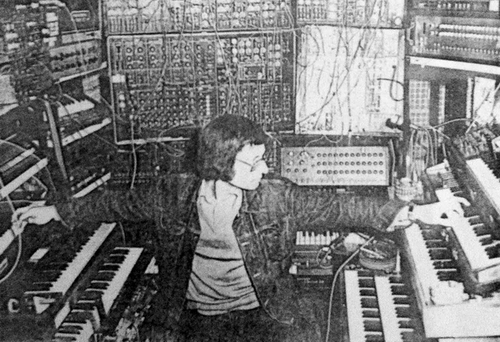 By the time Lorenz passed away in 2000 he owned 38 synthesizers. The guy was a mad genius, chainsmoking and knob-turning like a cross between a mechanic and Dr. Who. I have not delved into any of his other albums as of yet. I’m not even sure they’re out there to be had. So, I’m going to go on the assumption that Invisible Voices will be my only foray into Rüdiger Lorenz’ synth handiwork. If that is indeed the case, then I can be happy as it’s a hell of an album. It creates the aural atmosphere of some lost science fiction soundtrack. It doesn’t get weird and wobbly like so many other synth albums have in past. In fact, I’m listening to it as I type this on a brisk, early Saturday morning as the kids still sleep. It lulled my wife back to sleep in the recliner in fact. It’s one of those kinds of records. It’s not tense or dramatic like Sinoia Caves’ Beyond The Black Rainbow. It’s not dark like Bernard Szajner’s Visions of Dune, or quirky like Morton Subotnick’s Silver Apples of the Moon. It’s music of its time, and its time was the early 80s. Being a kid in the late 70s and early 80s I have a soft spot for the analog synthesizer, and Moogs especially. Songs like “The Sun of Shangri la”, “New Atlantis”, and “Out of the Past” elicit both old and new. While these synths tried to give the feeling of “the future”, they somehow end up sounding even more ancient. They don’t sound like the future, more than a voice from the past interpreting what the future may sound like. There’s a naivety to this idea that I love. Much like watching George Méliès’ La Voyage dans la Lune or Fritz Lang’s Metropolis, you get this incredibly imagined version of the future. It’s child-like in the overzealous and over-the-top vision. Synth music is a lot like that; at least back in the earlier, knob-turning days. Back when guys like Lorenz were patching cables here, there, and everywhere to create these spaced-out sounds. Reading the list of synthesizers he used for this record is pretty mind-boggling. Let me break it down for you: Korg Polysix, Formant Synthesizer, Roland Vocoder Plus, Korg Vocoder VC 12, Roland TR-808 Rhythm Composer, Moog Sample & Hold, MXR Stereo Chorus, Electro-Harmonix Flanger, PPG Sequencer, Elektor Ring Modulator, and a Pearl Vorg Echo-Orbit. Not to mention the unholy amount of German cigarettes he inhaled during those late night recording sessions in his home studio. I’m wheezing just thinking about it. I can’t say enough about this album. I took a long walk a couple of Sundays ago and had this playing on my mid-afternoon quest for calorie burning and fresh air breathing. It was absolutely perfect for a jaunt like that. I found my mind wandering here, there, and everywhere. Invisible Voices acted as a reset button of sorts for my brain. It allowed me to thoroughly enjoy that warm, sunny walk and travel(in my mind) far beyond the few miles I physically took in. 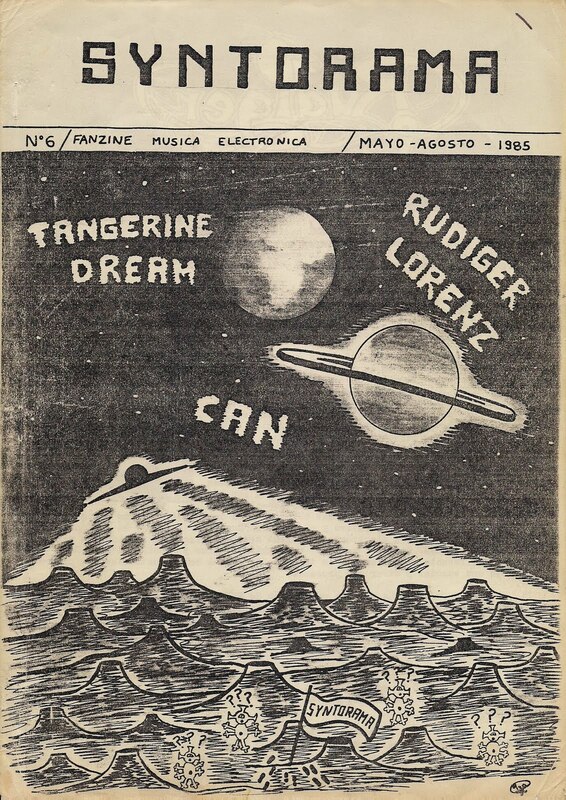 This Rüdiger Lorenz album also proves a very distinct point that I sometimes forget: there’s always something great out there I haven’t yet heard. I do get into ruts where I think there’s nothing left for me to find musically. On those grey cloud kind of days I think everything great has already been written and everything new is just xerox copies of those great albums. Then I’ll stumble across a lost gem like Invisible Voices and I get excited again about music. Or I’ll hear a new artist that gives me hope for the future. Granted, those ruts only last about a day. But still, those are scary days. Pearl Vorg Echo-Orbit? Damn you Hubner, damn you to Hades! I’m going to end up buying this aren’t I? Chances are good. Chances are very good. That list of synths is mind boggling. And he probably built half of them himself. Thats two LPs you’ve made me buy in a week! Very, very Jean Michel Jarre this one. The whole second side sounds like Zurich Schnauss too. Terribly sorry about bullying you into this one as well. It’s a problem I’m working on. Jarre? Yeah, I can hear that. I’ve only heard Schnauss’ first record, but I think you may be right. I love the fact that this guy made these albums on his own, like after work, and self-released them himself. Shows he was in it completely for the love of music.